Code Purple is moving from the Pathway Shelter at Stein Hwy Church of God to St. Luke’s Episcopal Parish House at 202 N North Street, Seaford, DE 19973. Effective on Sunday, January 31st, 2016 at 7pm, St. Luke’s will be hosting for the remainder of our Code Purple season. Check In will be at 7pm and check out is 7:45am. Please enter through the double doors on King Street. The Code Purple Team wishes to thank Pastor Dan and the entire congregation of Stein Hwy Church of God for giving our homeless guests a warm place to be out of the elements. Without you, we would not be where we are! You gave us a strong foundation on which we are giving and loving our unsheltered guests. We look forward to continue working with you on finding the solutions to our homeless guests needs. The Pathway Shelter will no longer be a drop off location or open to our homeless guests. Please continue using Home Team Realty at 959 Norman Eskridge Hwy, Seaford, DE, Monday through Friday 9am to 5pm and Saturdays 9am to 12pm for donation drop off. We are thankful to St. Luke’s for opening their hearts and their doors to give shelter for the remainder of our season. It takes the village coming together to love, feed, and house the most vulnerable of our community! Any questions please contact Nikki at 302-519-0024 or sussexcountycodepurple@gmail.com. 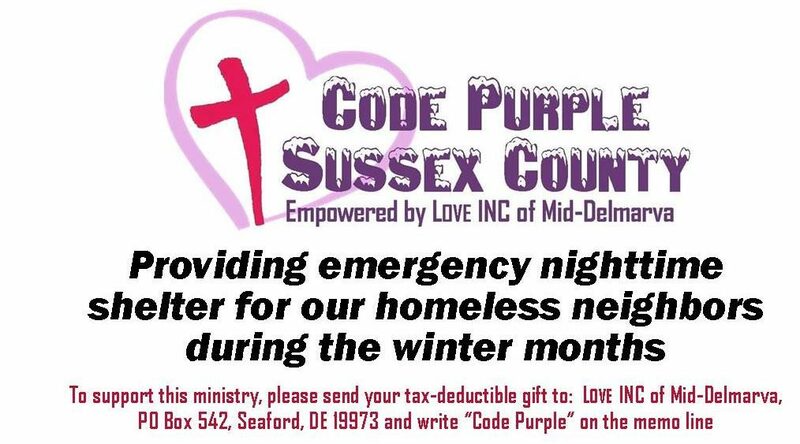 Sussex County Code Purple Shelters are activated for Monday 1/25 to Sunday 1/31. Pathway Shelter, Stein Hwy Church of God (425 E Stein Hwy, Seaford, DE) open 7pm-7:45am. Gateway Fellowship (8110 Cannon RD, Bridgeville, DE) open 8:30pm-7:45am. Women and children only. Transportation provided from Pathway shelter after dinner if needed. Pathway Shelter at the Stein Hwy COG, Seaford will be closed on Friday 1/22 & Saturday 1/23. On FRIDAY 1/22 our guests must meet at Hardin Hall, 18 W Fourth Street, Blades, DE by 7pm for intake and dinner. After dinner (8:30pm) our female guests will be transported to Gateway (8110 Cannon Road, Bridgeville, DE) and our male guests will be transported to Laurel Nazarene (94 Walnut Street, Laurel, DE). If snowed in our female guests will stay at Gateway for the duration of the weekend and our male guests will remain in Laurel. Centenary UMC (200 Market Street, Laurel, DE) will be open Saturday and Sunday from 7am till 6pm. Our male guests will be transported from Laurel Nazarene to Centenary on Saturday morning and Sunday morning. ANYONE seeking shelter during the day is encouraged to go to Centenary UMC. They will serve lunch and a steady supply of hot coffee and snacks. Gateway Fellowship will open at 8:30pm Friday 1/22 to Sunday 1/24 for females only, located at 8110 Cannon Road, Bridgeville, DE. Laurel Nazarene open from 7pm to 6am Friday 1/22 to Sunday 1/24 for males only, located at 94 Walnut Street, Laurel, DE. Centenary UMC open from 7am to 6pm Saturday 1/23 and Sunday 1/24 for anyone needing shelter, located at 200 Market Street, Laurel, DE. Overflow for Friday night will be Mt. Olivet only by appointment. Must call Nikki at 302-519-0024. Overflow on Saturday will be Pathway and Mt. Olivet only by appointment. Must call Nikki at 302-519-0024. Transportation during the storm will be an issue. Anyone able to transport our guests is encouraged to call Vikki at 302-853-0997 to be added to our stand-by list. Anyone experiencing homelessness, please call 302-519-0024. Code Purple Shelters activated for Mon 1/18-Sun 1/24! Please click on the link above to see our Director, Nikki Gonzalez, and Love INC of Mid-Delmarva Executive Director, Susan Kent, interviewed this morning with WBOC Reporter, Lindsay Tuchman, about our Code Purple Shelters here in Sussex County and how important our shelters are. Thank you to Dwayne for talking with Lindsay about his experience with homelessness. We want to get the word out to those experiencing homelessness that we are open and where our shelters are located. We are in need of volunteers to make dinners and to stay overnights at all our shelters. Please call Nikki at 302-519-0024 for more information! Text GUEST1 to 84483 to receive Guests alerts from Code Purple Sussex County. Text VOLUNTEER1 to 84483 to receive Volunteers alerts from Code Purple Sussex County.